Models posing on stage. The DECA Prom Fashion Show was on Thursday, January 17th. Audience members got the chance to look at the year's most popular prom dresses from RSVP Prom and Pageant and help a good cause. "We're raising money for Burt's Big Adventure, which is a charity that sends children with chronic and terminal illnesses to Walt Disney World," stated junior Isabel Hui. "That's our huge project this year." Students strut across the stage, adorned in the latest and most popular prom dresses and tuxedos. The audience claps and cheers for those on stage, showing their support. Cameras flash as students makes a pose. For one only night, they get to be models. DECA holds a prom fashion show every year. 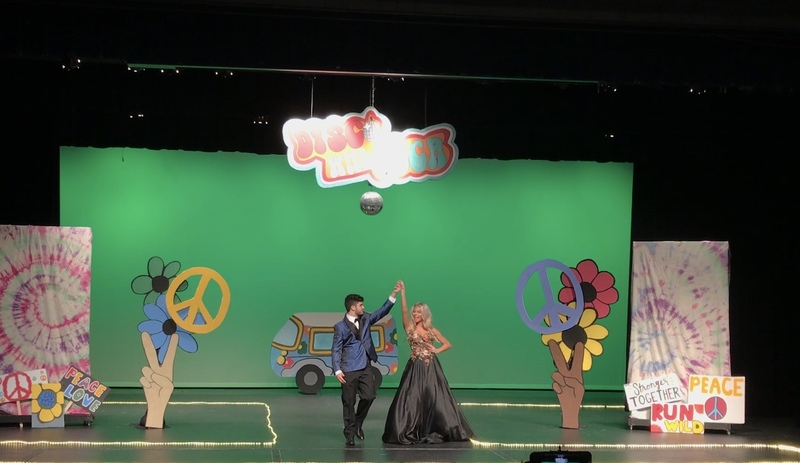 This year’s theme: Disco Night, decided by the Advanced Fashion Marketing class, was on January 17th at the Performing Arts Center, with the option of a 6:00 and 8:30 show. With the purchase of the $9 ticket came a $70 off coupon for the rental or purchase of a tuxedo at the Tuxedo Wearhouse. All proceeds went towards Burt’s Big Adventure, which is the project DECA has been raising money for this year. Preparing for the show since October, the DECA program makes sure that the night goes smoothly.